Plus, a Twitter user advises her to stay at home and be a wife. 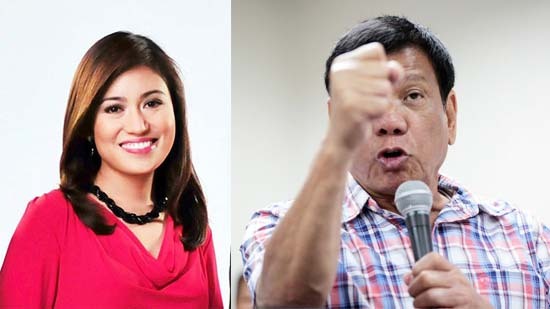 (SPOT.ph) "It may have been improper from a president-elect but, of course, we will continue to do our job and we are not expecting any apology from him personally," GMA News anchor and reporter Mariz Umali said in an interview with Kara David on News to Go today, June 2. 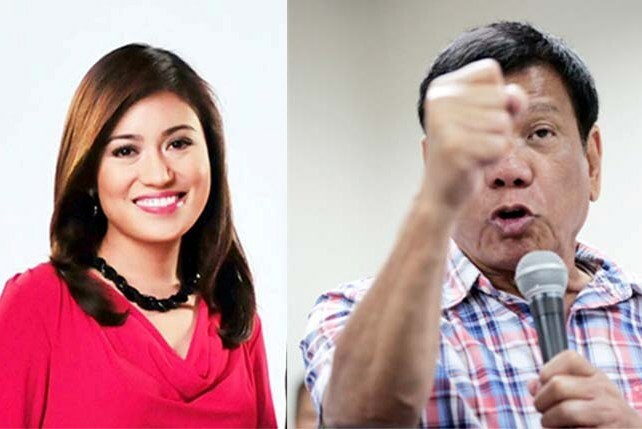 The journalist was catcalled by incoming president Rodrigo Duterte during a press conference in Davao City yesterday, June 1—just a day after he made a controversial statement related to media killings. "From their end, walang lumapit o nakipag-usap man lang. I'm not expecting any apology pero wala man lang nakipag-usap from their end," Umali added. The press conference was apparently a free-for-all where reporters had to raise either their voice or their hands to catch Duterte's attention. Umali, who was seated at the back row, had to declare: "'Sir, I'm here.' Doon na niya sinagot na parang nagpapansin daw ako tapos sumipol na and then later on kumanta." Despite the catcalling and teasing of the audience, the reporter kept her composure. "I tried to understand what the situation was and tried to get my answer, which I did," she said. 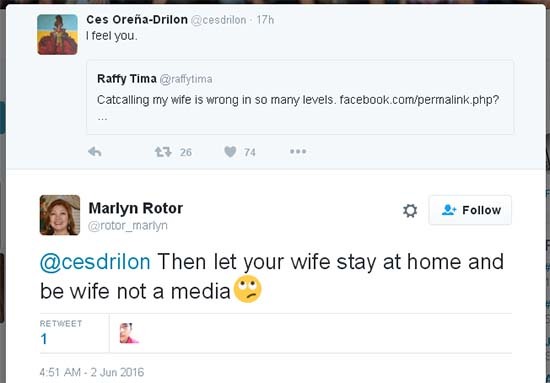 Umali's husband and fellow GMA News anchor Raffy Tima, however, wasn't as calm as his wife. He expressed dismay over the incoming president's actions and posted on his Facebook page that it was "so wrong on so many levels." 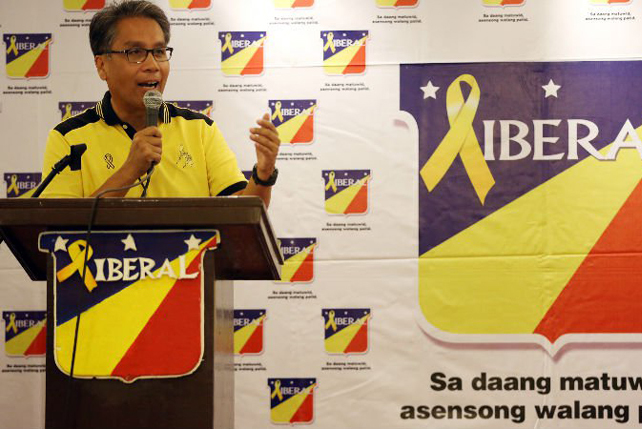 "I expected that from a Mayor Duterte. I know his reputation well enough not to be shocked by it, but that does not make it right." A certain @rotor_marlyn, however, is also drawing controversy from the incident. 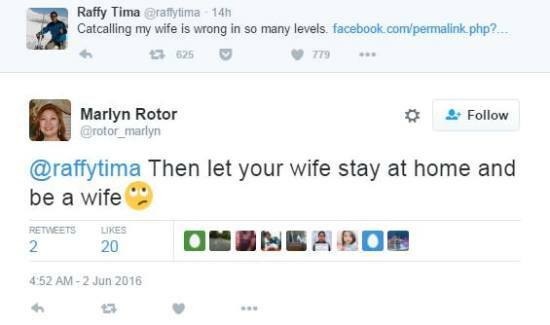 The "entrepreneur from California," according to her Twitter page, tagged Tima to this tweet: "Then let your wife stay at home and be a wife." She also tagged ABS-CBN anchor Ces Drilon to the same message. 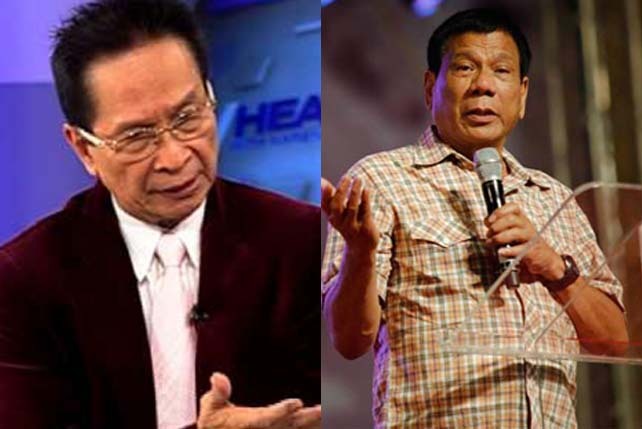 Incoming presidential spokesperson Salvador Panelo has explained Duterte's actions. "Mayor Duterte is a very kind, playful individual. 'Pag siya'y pumito, ibig sabihin he's fond of you, ibig sabihin mahal ka niya, kaya ka binibiro. Hindi po isang pambabastos 'yon. On the contrary, the receiver of that should be complimented." Catcalling, according to Kara David in the News to Go report, is a form of sexual harassment. The United Nations' Convention on the Elimination of All Forms of Discrimination Against Women has also chronicled that women have been fighting for equal rights in the workplace since the 19th Century. This has led to international laws protecting women's rights as workers.